Immunohistochemistry analysis of frozen mouse spinal cord with HO-1, mAb (HO-1-2). Immunohistochemistry analysis of frozen human prostate section (stressed) stained using HO-1 (Hsp32) mAb (HO-1-2). Flow cytometry analysis of human lung cancer A2 cells stained using isotype control antibody (left) and HO-1 (Hsp32) mAb (HO -1-2) (right). 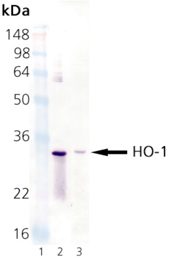 Western blot analysis: Lane 1: MW Marker, Lane 2: HO-1 Recombinant Rat Protein (Prod. No. ADI-SPP-730), Lane 3: Rat Liver Microsomes (Prod. No. ADI-LYT-RM100).